Everton were the visitors today at Stamford Bridge in a game of second versus third. After the Champions League trip to Moscow on Tuesday, Jose made three changes to the team. In came Tiago for Scott Parker, Babayaro for Gallas at left back and Paulo Ferreira for Glen Johnson. Tiago’s inclusion was due to Scott Parker’s wife giving birth a few days ago, so congratulations to Scott, his wife and the new addition to the Parker family. Last season Everton came to the Bridge with the game ending 0-0. It was probably one of the dullest games at Stamford Bridge for a long time, but today was different. 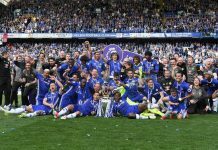 Everton came to Chelsea third in the Premiership with fourteen of their current squads contracts ending in the summer. It meant that a lot of the current squad were playing for their futures at the club and possibly a reason why they are trying to do far better this season than they did last. Today was a game that Chelsea needed to win; it would keep us in touch with Arsenal at the top of the Premiership. With the Gunners kicking off at 5.15pm, a victory would have put Chelsea top for at least a couple of hours. The game started quickly with Everton putting pressure on the Chelsea defence within the first few minutes. In the first minute in fact, a Steve Watson shot was blocked by John Terry from six yards out, it showed the steely determination of the new Toffee’s who hadn’t lost away in the Premiership this season. After the first few minutes Chelsea settled and started to show their home advantage. We gained three corners in a row after six minutes; however, all were cleared without too many problems by the away defence. The best chance of the first half from Everton came in the 19th minute when a cross-found Cahill, his header was on target but Cech dived brilliantly to save. Along with the back four, Cech is having a great season and is pulling off some saves that are quite majestic at times. Chelsea continued to pressurise the away team and in the 25th minute we went the closest to going ahead as at any time in the half. Robben picked the ball up and shot from all of 25 yards, Nigel Martyn got his fingertips to the ball and touched it over for the corner kick. From the corner Damien Duff had a shot that was blocked by Weir, and then Eidur Gudjohnsen looking to score had his effort cleared off the line by the rather annoying Gravesen. Chelsea were getting more possession and just before half time, the magnificent Arjen Robben went close again. He got past two defenders and hit his shot just over the bar. By the end of the first half we had been gifted no less than twelve corners. However, none resulted in a shot on target or Martyn being given any trouble whatsoever. The second half started without any substitutions, it looked like Frank Lampard had picked up a slight knock near the end of the first half, but he came out for the second 45 minutes and didn’t look any worse for wear. In the 49th minute Chelsea got their thirteenth corner of the game, however, this like all the others didn’t test Nigel Martyn in goal. Everton got their first corner of the game in the 56th minute and from their very first corner they could have easily taken the lead. The ball came swinging in from Gravesen and when the ball came to Alan Stubbs from what looked like an easy opportunity to score, he put the ball wide of the post. A massive let off for Chelsea. Just after the Everton corner Jose took off Tiago and bought on Mateja Kezman to go with four up front in Duff, Robben, Gudjohnsen and Kezman to try and break down the stubborn Everton defence. The 64th minute bought about a free kick that Arjen Robben stepped up to take with his left foot, the ball just missed the upright with Martyn scrambling across. If the ball had just been a foot to the left it would have bulged the net and we’d have been 1-0 up, however at that point it wasn’t to be. The Everton fans in the lower tier of the East Stand were getting more vocal believing that they’d almost got what they’d come for and that was the draw and the point to take back to Goodison Park. Chelsea were getting closer to the goal that the home fans were hoping for and a John Terry header into the path of Eidur Gudjohnsen was blazed over when again it looked as though the Ice Man would bury the ball into the back of the net. Then came the goal we were all waiting for. An Everton free kick resulted in Eidur Gudjohnsen regaining possession for Chelsea, he passed the ball to Arjen Robben in his own half, Robben then ran half the length of the pitch and got away from a couple of challenges before he chipped the ball beautifully over Nigel Martyn, the ball nestled into the net and the home fans went crazy. 1-0 Chelsea and Arjen Robben’s second goal in a matter of days and his very first in front of the Stamford Bridge fans. Again the day belonged to the fantastic Robben who had created the most chances for Chelsea and then when it was needed, he managed to score the all-important goal. A minute later Everton nearly made it 1-1. A cross-found the former Millwall player Tim Cahill; he headed his effort at Cech, who again made the save when it was required. David Moyes then decided to shuffle his pack and instead of the 4-5-1 system he started with he took off Steve Watson and bought on the veteran Kevin Campbell to give his team a more attacking 4-4-2 system. However, this was way too late, Chelsea had only conceded one goal at home in the Premiership all season and they weren’t about to be breached again. Just to counter Moyes, Mourinho bought on Robert Huth for Damien Duff and played John Terry just in front of Carvalho and Huth to counteract Kevin Campbell’s power. The end of the game came with three added minutes. In that time Chelsea got their fifteenth and sixteenth corners of the game, however, again neither tested the Everton keeper as we just tried to keep hold of the ball. The final whistle blew and we were top of the league. After writing this, Arsenal have drawn 1-1 at Crystal Palace, which will keep us top for the next week. It was only three weeks ago that we were defeated by Manchester City and we were five points behind our North London rivals. Tonight we’re two points ahead. Is now the time to start believing? Well, at least for the next week Rob can walk with his head held high around the Highbury area. Just keep saying to yourself Rob … WE ARE TOP OF THE LEAGUE, because I’m sure we’ll all be thinking and saying it too. Everton: Martyn, Hibbert, Weir, Stubbs, Pistone, (McFadden 84) Watson, (Campbell 80) Osman, (Chadwick 90) Cahill, Gravesen, Kilbane, Bent. Subs Not Used: Turner, Yobo.